I’ve put off writing this last installment to my three-day Hong Kong post series simply because there’s really nothing interesting to write about. Back at my Couchsurfing host’s flat, we spent hours chatting about a lot of things, looking at our photos taken during the trip and drinking Belgian beer (well, them at least). We finally ended at 1am, and since I plan on leaving the flat early to explore Hong Kong Island on my own, I bade them goodbye. Sayuri and her new friends. 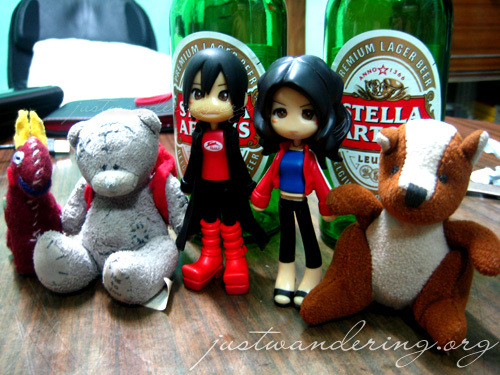 The small plush toys were the Belgian’s travel gnome. The bear has a backpack that a friend of theirs hand made for them, which has the logo of Antwerp, their home city. Despite the exhaustion I felt from not having enough sleep and hiking the Wilson Trail, I still had a hard time falling asleep. I watched one episode of Yamato Nadeshiko Shichihenge on my laptop before finally dozing off at 2am. My alarm woke me up at 6am, and after a couple of snooze, I dragged myself out of bed to get ready. Dressed and packed, I tidied up my bed, as courtesy to my hose and made my way out of the apartment. It was a Monday, the start of the work and school week. However, since it’s still pretty early, the streets are pretty empty. The trains were a different story though. The trains were frequent in Hong Kong, and if you miss one, another one will come along within minutes. The trains were full, but not jam packed as the MRT in Manila during rush hour. Inside the station, there’s a sea of people as each train arrive to deliver a fresh batch of students and employees making their way up to the street level or to the other train line. 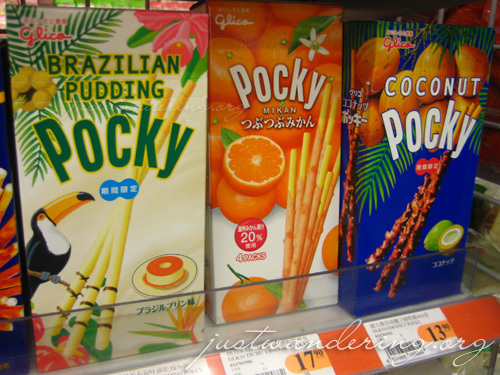 I was baffled by so many Pocky flavors! I plodded along, weighted down by my backpack, laptop bag and my sleep deprivation. I was sometimes forced to walk fast because everybody around me was hurrying, but as soon as it cleared, I just took a pleasant stroll around the station. I was looking for breakfast places, but at 7am, there aren’t many open save for convenience stores like 7-11 and Circle K. I mentally kicked myself for not going to the roast place I saw near my host’s house the previous day, because I found myself wandering aimlessly at Causeway Bay. There’s plenty of maps in Hong Kong. You can get them for free at the airport, and there are maps inside the MTR station. Though I made it out the correct exit, I was still unable to get my bearings once I was on the street level. I walked and walked and walked, until I saw this Chinese dimsum place that’s almost full with patrons. 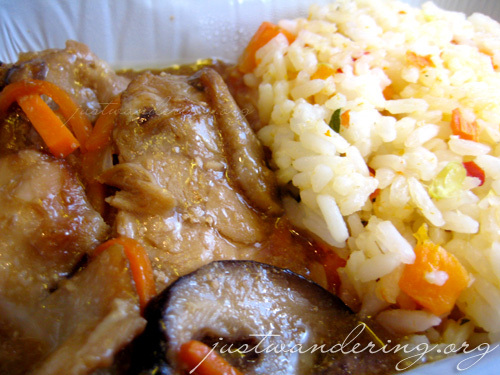 It was a pretty good sign that the place serves good food, but I hesitated. All the signs were in Cantonese, and I’m rather apprehensive about ordering something I know nothing about. I’m all for being adventurous, but I didn’t think I was in the right state of mind for anything exotic. My only photo of Causeway Bay. Sad. I continued walking and realizing that I’m running out of time, I resignedly walked back to the McDonald’s I snootily passed before. In the spirit of being adventurous, I passed on my favorite Sausage Mcmuffin for a bowl of noodle soup. It was… okay. Not exactly something I’d order again. I hurried back to the MTR station to catch the train back to the airport. 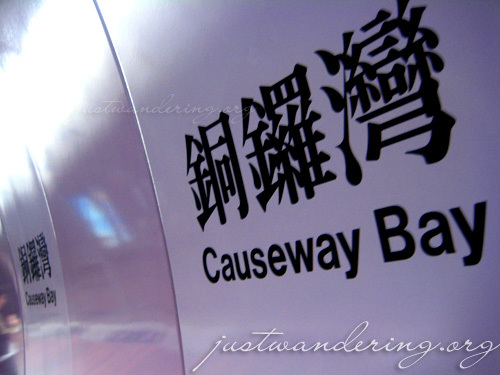 From Causeway Bay, I took the train to Central station, attempted to find the train on the Tung Chung line. There’s no shortage of signs inside the HK MTR stations, but in my disorganized state, I missed the stairs going down to the trains and ended up going OUT the station *facepalm* I ended up using up the last credit on my Octopus card and had to buy a single ride ticket from the vending machine. I told myself to be more alert, and got on the correct train… only to go down one-stop short of Tsing Yi. Moral of the story: be sure to get enough sleep when you’re going to wander about with your backpack, specially if you have a plane to catch! 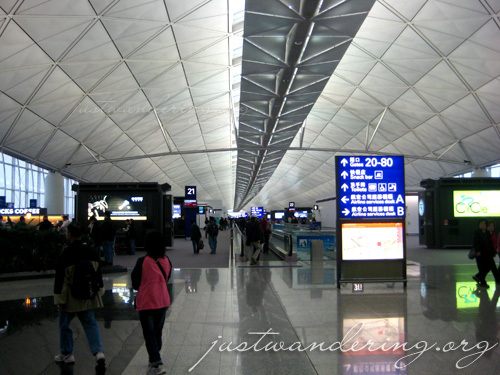 Soon enough I was once again inside the Airport Express, making my way to HKIA. I was sitting on the other side of the LCD screen, and was barely paying attention to what was showing in the screen. I was just barely able to catch the listing of airlines for each terminal. At the airport, the train doors open on both sides, one going to Terminal 1, the other to Terminal 2. I went out to Terminal 1, and upon entering, I saw that Philippine Airlines is at Terminal 2. Meh. Going to the other terminal was easy enough. Like the MTR stations, there are lots of signs inside the airport, so it’s pretty hard to get lost inside the massive buildings. There were hardly any lines at the check-in counter and I was able to get my boarding pass in less than five minutes. It was rather disconcerting when I saw T1 scrawled right next to my gate number on the boarding pass. I checked out some shops, looking for souvenirs to take home to my family, since I hardly bought anything when I was still in the city. What I liked about HKIA is that there’s plenty of seats so you can rest while exploring the huge airport. I followed the signs to the gate, and to my surprise, it took me to another train, which would take me back to Terminal 1, where all the planes are. As I was meandering along the walkway leading to Gate 80, I kept looking around, wondering if I’ll see another passenger throwing a hissy fit because she wasn’t able to make it to her plane on time. There was none. Pfft. The waiting area was big, and I heard from friends that there’s free wifi in the airport. Though there were already plenty of passengers waiting for the plane to allow us to board, I was still able to find a seat and hurriedly took out my laptop. Ironically, as soon as I logged in to XP, the gate opened. I shut down my computer and sent of a quick text to my mother that I’m boarding the plane already. It was another Boeing 747-400, but sadly, it wasn’t one of the newly refurbished ones. Boarding was fast — like the flight to Hong Kong, it wasn’t even half full. Though all the passengers were all boarded in the aircraft, we still had to wait for our set departure time to get the permission for air traffic control. In no time, we were up in the air. I didn’t like the show on the video screens, so I contented myself with reading the newspaper and the Mabuhay inflight magazine. Since I don’t really read the newspaper and I find reading magazines a bit of a bore, I was left with nothing to do in no time. It was a good thing the flight was nearly empty, so I was able to stretch out in my row and doze all the way to Manila. hi nina! thanks for the visit! ooh pocky! i’ve only tried the strawberry, i didn’t know there’s a whole lot more flavors. wish i could go back to hong kong. last time i’ve been there was eons ago. next time though, i’ll be bringing my daughter, hopefully it’s someday soon. Wooo I miss Hong Kong! And I miss their MTR. Sigh. Hope I could go back. I saw them too (Pocky) on our trip last week. But I feasted on Nestea Honey Pear tea and other drinks in 7-11. We weren’t able to hike the Wilson’s trail, we went to Lantau Peak na lang. Didn’t created a post yet. I love Stella Artois! Also, I can’t wait to be back in HK! Have a lot of good memories from Causeway Bay, long walks with a special friend in Victoria Park, weekend visits to the Central Library, etc etc. Ahhh.. I missed it!